I am all up for a bargain, especially when it comes to two of my favourite things, make-up tools and jewellery. When Shop MissA contacted me, I confess I had not heard of them before. But boy was I intrigued to find out that everything on their website retails for as little as $1. Spoilt for choice, it was extremely hard not to choose the entire website. Despite containing many make-up items such as lipsticks and eyeshadows, I shied away from those because I'm extremely picky when it comes to finding the right products and I wasn't sure about the quality to be quite honest. Make-up tools and jewellery were a different story however as I saw the brand e.l.f. and was excited to give it a try. One can never have too many blending eye brushes and that is exactly what I thought when I chose the e.l.f. Essential Blending Eye Brush* for $1. You read that right. It blends extremely well, the bristles are soft yet dense enabling the creation of a natural finish to any eye look. And, I also got myself an e.l.f. Eyelash Curler* because shame on me I've never had one. It is of really great quality, comes with a replacement pad and does its job at curling my lashes prior to mascara application. Needless to say I am in love with these bits, and am really looking forward to adding a few more brushes to my collection. Onto jewellery, I went for a few earrings because a girl can always do with more earrings. Truth be told, my ears are very sensitive and I usually only wear gold earrings but given I don’t plan on wearing these more than a few hours, they are good addition my ever growing stash. Front & Back Pearl Earrings* are extremely popular thanks to Dior so of course, I got me a cheapy pair. I wore it on my Faux Fur & Leather look and a lot of people complimented on it so if you were wondering what I was wearing; now you know. And being a flower is power kinda girl, these gorgeous Flower Chandelier Earrings* found their way to my basket and I can’t wait to wear them come spring. Two things my jewellery collection is lacking of are rings and bracelets and that is because I always end up wearing the same bling (ie. engagement ring and Pandora bracelet) over and over again. 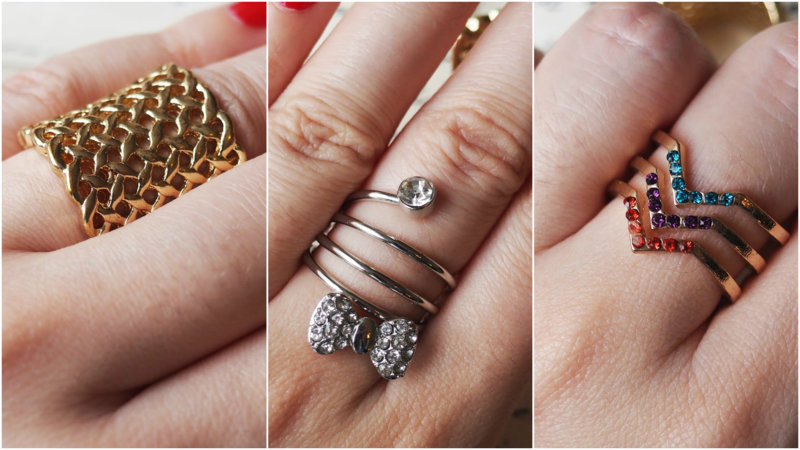 In the attempt to switch things up a little these beautiful rings were also sent to me; from left to right we have: a Caged Ring*, a Coil Ring* and an Arrow Caged Ring*, all of which I'm happy to report don’t leave my fingers green. Additionally, when I saw the variety of charms on the website, I knew I had to get me a Charm Bracelet* too. I picked out charms that mean something to me, like family, faith, music and blogging. In terms of quality they aren't comparable to Pandora standards but they are fun and cute and make up a great looking bracelet that is sure to add that extra touch to a casual outfit. All in all, I love everything I received and this haul really proves that low prices do not automatically mean poor quality. Sure the jewellery quality isn't out of this world, but if you want that little something every now and then to spice up your look, MissA is the place for you to check out. Also, I cannot fault the make-up tools; e.l.f. is definitely a brand I've wanted to try for ages now and I am so glad they stock a few products from them as now I know what all the fuss is about! What do you think of my $1 goodies? Let me know below! *All items sent by the brand. All opinions are my own (disclaimer here). I love the stones on it too. Back to the main point: I've definitely heard lots of amazing things about e.l.f and can only wish that we have the brand here. They sound pretty promising for their price! Pretty jewels and stunning photos!!! Oooh wow. I will definitely have to check this website out. Could do with a few make-up tools too. Does it convert to £'s? And WHAT? You've never had an eyelash curler?? LOL that was the first experience with "makeup" I had access to when I was younger xD But yes, so glad you can add it to your routine now. Definitely agree about the blending brush - never have enough! Great picks Pam, I love the earrings!! Jewellery chic! I like everything here! All such pretty bits, I particularly love that gorgeous arrow ring, and the makeup tools sound fab too! These are all so pretty. I used to buy loads of cheap jewellery but as I've got older I just wear my special pieces day in and day out. I definitely am lacking in the rings department and bracelets, but rings are just something I never seem to buy. These are very cute pieces, I love the rings. The arrow cages ring looks so cute, I love the colours! I also love the pen/quill and mini magnifying glass in the photos! Okay, so those pieces are beautiful and I'm totally checking out that company, but also, your photos are so lovely! Your composition of each of these shots is just great. This is so true. Cheap prices really do not equal poor quality. Sometimes I find that certain cheap products really are better than say, high end products. Especially when it comes to make up. I hadn't heard of the brand before, but they look so gorgeous. I too am lacking alot in the jewelry department, and I don't know why because it really is something I love and something I always look at in others. I guess I'm just silly. My favourites in this entire post probably have to be the rings though. They are too gorgeous! Gonna have a look in their store and gonna have to control myself as to not spending everything I have! Wow $1, what a steal! Awesome! And your photos are too pretty! Gorgeous jewellery <3 can't believe the price!! Stunning photos too! This jewellery is so pretty and unique too! It can imagine them being great as subtle, statement pieces. Also the face that they're $1 makes it even better, that's amazing. These rings and charms are awesome and it's amazing how cheap are items in this shop! Beautiful bling-bling, Pam. I heard a lot of good things about e.l.f. I am curious about their makeup remover pen or whatever they call it. Anyway, your photos are outstanding, Pam!!! Wow! Such beautiful and unique pieces love those rings specially. Those bow earrings are adorable!! That`s amazing, I`ll definitely browse their website. I love the earrings and that charm bracelet is so cute! The jewellery you chose is pretty. Love every one of them.. from the earrings to the bracelet and rings. I am amazed that you found everything online so cheaply. I probably would also wear them but since I am alergic to too many materials I usually stick to gold and platinum. So, for now I am wearing only my diamond engagement ring that I received eight months ago. However, I am really considering to also buy some jewellery from your suggestion list. Not sure if I am brave enough to wear them for longer than an hour or two but I think it is very cute.